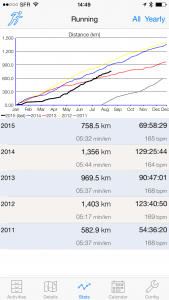 Version 2.1 of ConnectStats introduces the ability to see year to date or month to date statistics. 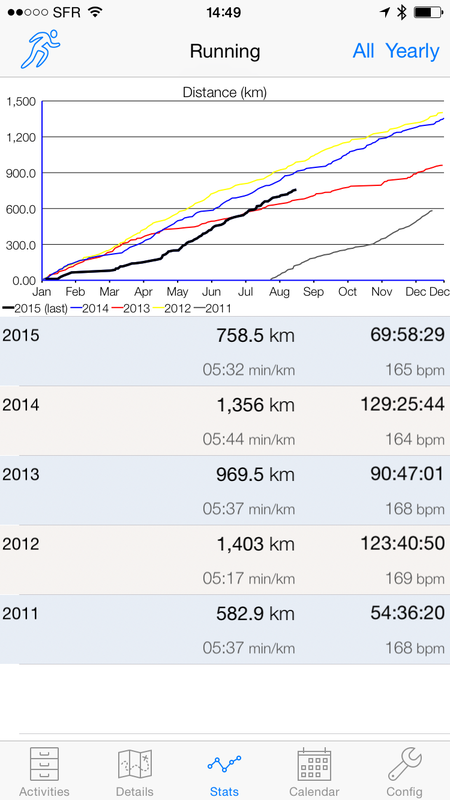 The yearly cumulative graph was already giving a good idea of how well you were doing this year versus the last, but now you can see the full stats you reached at the same point of last year. 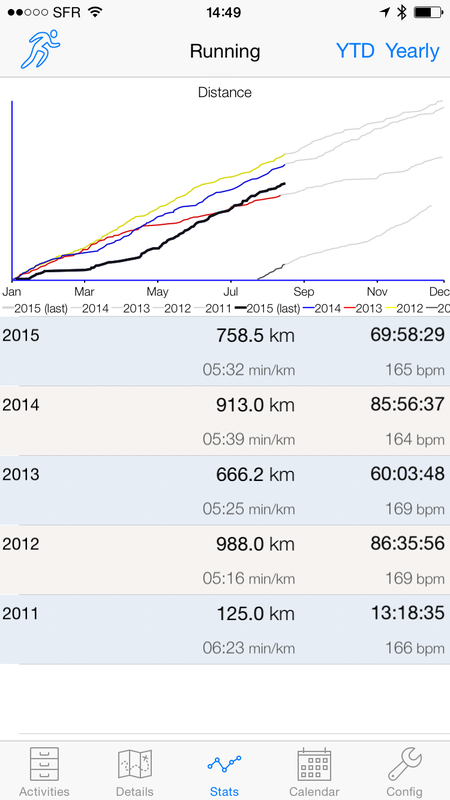 Below for example you can see that in 2015, so far I ran 758km, while on the full year of 2014 I ran 1356km. 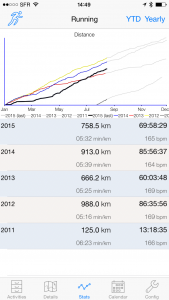 If you press on the button All, you get to the YTD screen, that shows that in 2014 at the same point in the year as today (August), I had run 913km. In the monthly view, the graph is slightly different, the full month bar is shown, but the blue shows how much for each month was reached at the same point in the month, here around august 15, or about half way through the month. Brice, I’m sure you’ve had this request before. I use both Garmin and Map My Run. 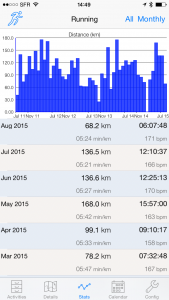 Garmin for when I have my Garmin device and MMR when I’ve only got my phone. It would be supremely awesome if your app would pull data from both and display them both at the same time. Good stuff! It’s one of the views I like most. Thanks for the continued efforts. Yes, but currently you have a shorter window available in the summary page. 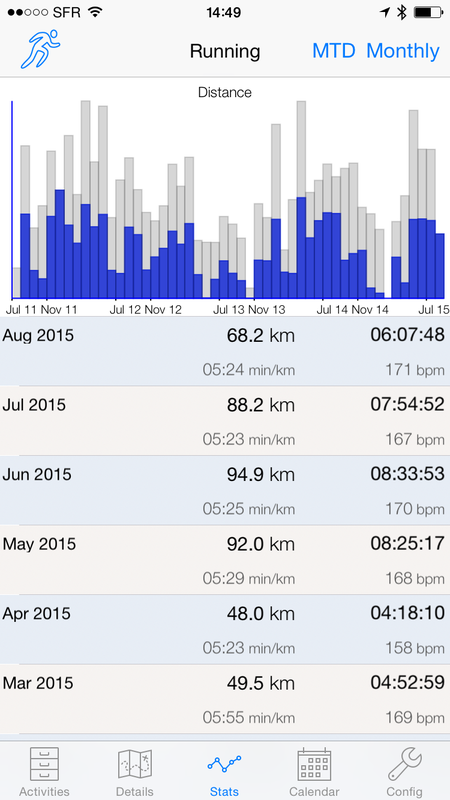 Also instead of simple cumulative it’s weighted by heart rate to account for the effort. You can search for performance on the blog to get detail. Is that close to what you want? hi, thanks for the suggestions. for the units, I could create a special “Australia” unit, is it common to use miles and celsius down under, or is it just you? For the airport, unfortunately, this is really up to garmin to choose the location for the weather. You may want to contact them. 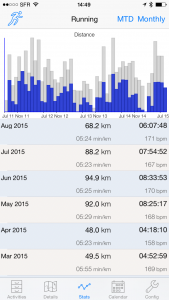 All ConnectStats does is display what Garmin collected. Just noticed Garnon connect actually has three settings, statute, metric and statute uk which does what I suggest. Cheers.